VAIO product name and serial number location on the product depends on when it was produced. 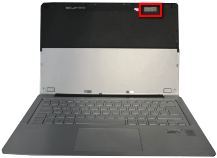 Note: Each VAIO also carries a black sticker on the bottom with a PCG reference, e.g. PCG-61M2. This reference describes a group of similar models, and is not used for support purposes. The product name and the serial number are shown on stickers on the bottom of the notebook. SVF142 and SVF152 series: serial number and product name are located underneath the battery. SVP112 and SVP132 series: Please open the battery door to find the serial number and product name. SVT112 series: Lift up the adjustable stand to access model name and serial number. SVF11N, SVF13N, SVF14N, SVF15N series: Set laptop in the viewer mode. The model name and serial number are located in the upper part of the display. The product name is on a sticker on the display frame or above the keyboard. The serial number is on a sticker on the bottom of the notebook. Note: For some models you need to remove the battery to see the serial number sticker. Alternatively, you can find the information in the BIOS or in Sony Software on your computer.